Be Known for Something : Discover Your Church Communication Thread / Business Essentials / 1 Tiny Thing I Hate Big Time. I’m not sure when it started happen. But I enjoy reading fine print in ads. It’s always tells volumes about the company when you read the tiny print somewhere obscured in the advertisement. Sometimes it’s serious while others have a tongue-in-cheek comment. I first try to get an idea about the overall ad appeal, then I scour the page/screen for the fine print. Advertising Promises: New! Greater and Faster Acid control. 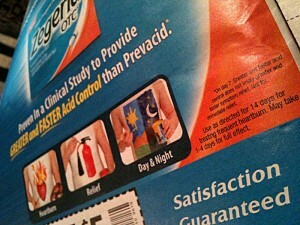 It’s obviously competing against Prevacid, so the fact that they named the product so it sounds similar is good. And the Greater and Faster Acid control is obviously aimed at their competition. Right? Well, introduce the fine print: *On Day 7. (Now get this…) Greater and Faster acid control does not imply greater and faster symptom relief. Not for immediate relief. I’m not sure how they get away with their ad then! And what does Greater and Faster Acid Control mean then? It casts doubt on the product. It appears the one promise of their ad (greater and faster acid control) is explained away in the fine print. Here’s 3 things I recommend for formulating fine print. Don’t let the fine print break the promise of your company. A brand is based on a promise. Your positioning or tagline should state this succinctly. Don’t let the fine print cast doubt on this promise (like Zegerid does!). Make sure it adds to the understanding of the product. Don’t let it raise more questions than answer. Be short. If you have to write a book to qualify your headline or subhead, it’s the wrong creative. So fine print isn’t always bad, but sometimes I dislike it strongly. Ok, even hate. What about you?